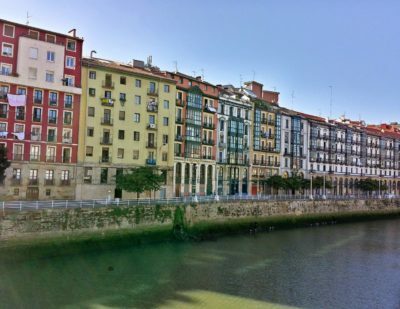 Bilbao – a prosperous port since the 14th century due to its sheltered location on the Bay of Biscay. This centre for culture has also always been a centre of tourism. Pilgrims on the Santiago de Compostela continue to find respite here as they have for centuries, rubbing shoulders with waves of day-trippers, backpackers, graduates, photographers, holidaymakers, investors, fashionistas, hipsters, and other travellers on the bustling boulevards. The logical explanation as to why this city attracts such a broad range of tourists can be found in the diversity of what it has to offer. Yet, until the late 1970s, this industrial river valley was in steep decline. So, what led to its rejuvenation? The immediate answer is architecture; an aesthetically pleasing city is a captivating city. Small businesses and bloggers, often mutually exclusive, thrive where there are an abundance of imposing facades. And, although the classical gardens and cafes nestled under apartments are sound competition, no facade is as awe-inspiring as the Bilbao Guggenheim. 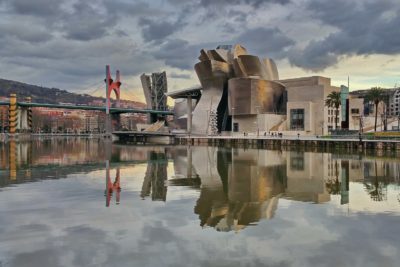 Bilbao reinvented itself with the opening of this internationally known museum. Although the city was most certainly on the rise financially when the museum was commissioned, crucially it changed the way foreigners thought about the city. The Guggenheim name is renowned worldwide, and by association is its European partner. Not to undersell the museum itself: it is certainly no knock-off. With expansive plazas, soaring curves, its architecture is legendary for requiring aerospace CAD software to design, surely a cruel and inhuman punishment on 90’s computer technology. The interior is worth the cost and queue as well. The atrium takes the appearance of a steel glass and concrete ravine, with bridges connecting the galleries on either side of the towering contemporary cliffs. Inside are many a Warhol, Richter, Kiefer, and Ai Weiwei to name but a few of the artists displayed. The city itself is a vibrant metropolitan hub of clashing cultures. With the city itself being proudly Basque, it is perhaps surprising that hostility between Spanish and local authorities is almost undetectable. The city is home to a diverse population, and being near the border between Spain and France, the majority of its citizens come from these two countries. This has resulted in one of Bilbao’s most attractive qualities: the cuisine. The coastal town is synonymous with seafood, with bars serving fine fishy pintxos and the Basque version of tapas – usually slices of bread topped with anything from Atlantic salmon to salt cod. Restaurants with a strong South East Asian influence are notably creative with local produce, as both cold and freshly cooked hot bites such as crab tempura and beef ribs with seaweed are available. Alternatively, more generically European food is available; a short cortado and a pastry can be picked up anywhere, any time. Such a city is unlikely to loose its appeal to those with an appetite for consumption soon. Perhaps the most striking feature of this city is its location. Nestled between mountains and beaches, and with a pleasant Biscay climate, there are a wide variety of activities around. The lowest of the summits, Artxanda, boasts a panoramic view of Bilbao, a municipal sports centre (with an open-air Olympic swimming pool, tennis courts…), a wide range of restaurants, and space for picnics. From the bridge above the Guggenheim, the complex is a short hike, with city transport links such as a funicular railway and a bus timetabled regularly. At the other end of the scale is Ganekogorta, just shy of one km in the sky, with incredible views for the persistent and well-equipped tourist. The Playa de Plencia, one of the many beaches near Bilbao, is also worth a visit for the more laid-back sun-soaker. For those avoiding what can be a tourist-infested coast, the many fishing villages offer a more culturally orientated approach to exploring the city’s surroundings. Overall, perhaps what makes Bilbao such a captivating city may be nothing tangible, purchasable, or easy to snap with a camera; it is the city’s attitude to life and the focus on people. The buildings are indeed beautiful, but only because the human elements of design, construction, and function are intrinsically obvious. Unlike the cold, clinical monoliths that many financial hubs have become, everywhere the pace of life is set by the population, from artists selling trinkets on the steps of the Guggenheim to groups of workers congregating around bar tables. The city is proud of its heritage and rejuvenation, while its population looks hopefully towards what continues to appear a prosperous future. A politics student, amateur photographer, and travel enthusiast interested in current affairs; I aim to inform, create interest, as well as to occasionally inspire.